Year of Young People 2018 is an opportunity to celebrate the amazing young personalities, talents, and achievers that make up Scotland. It is a platform for our young people. It will give them a stronger voice on issues which affect their lives, showcase their ideas and talents, and ultimately, aims to challenge the status quo and create a more positive perception of them in society. The YOYP planning group decided to hold a conversation café in the visitor centre at HMP Grampian and invited local partners to help facilitate the discussions with prisoners all under 26 years old from the Ellon & Banff halls. This event was very successful and attracted over 60% of the prisons young people population, with the majority signing up to get involved in further event planning throughout the year. 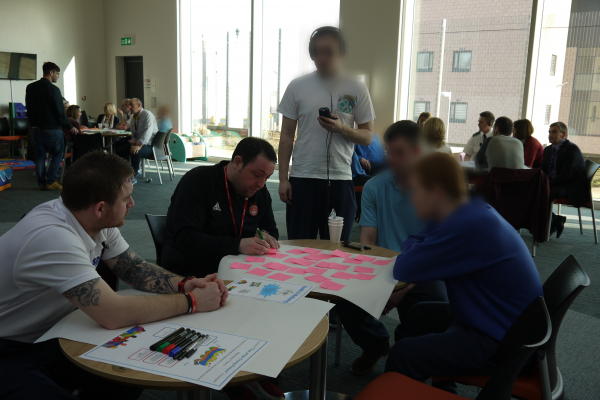 Every young person who attended the event was asked to sign up to help plan events based on the six themes. Ambassadors were also chosen to be the main voice of the year and help generate involvement of others. The Media Access Project has had a huge involvement with YOYP. The ambassadors meet once a week in the media unit and have also created a Media Team who will capture all the year’s events using Film, Radio, Magazine and Music. This will help build on their skills and experiences of creating media, whilst also chronicling the events and sharing them throughout the prison and beyond.